Every dollar invested in preparing for natural disasters could save seven dollars, said Alice Hill, Research Fellow at the Hoover Institution, at a recent briefing on Capitol Hill. Catastrophic events like Superstorm Sandy present significant financial risks to U.S. businesses, the federal treasury, and the global economy. These complex emergencies have taught us that “everything is connected: our transportation system failed, our health sector failed,” said Hill, in the wake of these storms. Hill and Wilson Center Global Fellow Roger-Mark De Souza, who is president & CEO of Sister Cities International, presented a new report, Building Coastal Resilience for Greater US Security, which was co-edited by the Hoover Institution, Wilson Center, and the Stanford Woods Institute for the Environment. Around 39 percent of the U.S. population lives in coastal counties. In 2018, we have already witnessed some of the highest temperatures ever recorded, and sea-level rise is accelerating, said Hill. These changes threaten infrastructure, economic growth, and national security, with 128 U.S. military facilities at risk from just three feet of sea-level rise, according to the Union of Concerned Scientists. More data and information on these threats could help coastal communities adapt to the coming changes. The report’s recommendations include updating floodplain maps, making downscaled data available online, developing decision-support tools at a local level, and encouraging citizen scientists to gather local data. Private sector stakeholders should be engaged, said De Souza, since they operate key infrastructure and thus have access to valuable data and information. “There are a number of opportunities to develop a resilience dividend,” said De Souza, “so that when events happen…we’re able to bounce back better,” such as early warning systems and innovative financial mechanisms. Resilience bonds, for example, help anticipate risk and protect against future disasters. Resilience tools like these can not only save lives, said De Souza, they can provide economic, environmental, and social benefits. Coastal infrastructure to protect against storm surge, for example, should combine manmade and natural barriers, such as marshes, oyster beds, and coral reefs, which also have economic benefits by supporting seafood industry and tourism. From the Pacific to the Atlantic, the frontlines of climate change are the world’s shorelines, said speakers at a Wilson Center event on protecting coastal communities from climate threats. Can Caribbean Islands really adapt to extreme hurricanes? asks Judi Clarke. Native American communities on the frontlines of climate change could provide a model for how vulnerable coastal communities can successfully relocate. 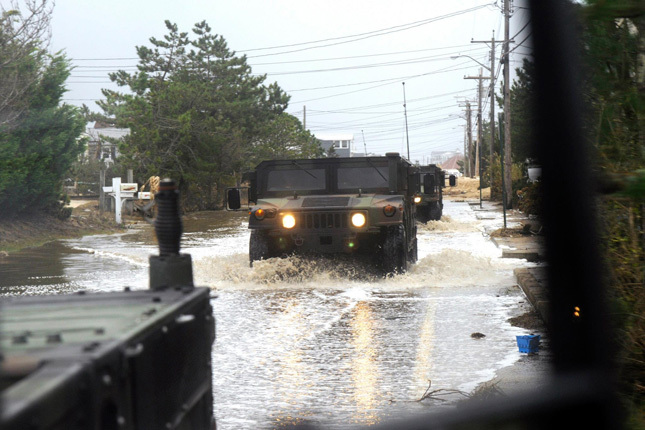 Photo Credits: Rhode Island National Guard responds in the wake of Hurricane Sandy, October 2012. Photo courtesy of the National Guard, by Air Force Master Sgt. John McDonald. Topics: adaptation, climate change, Congress, environment, featured, Infrastructure, military, On the Beat, resilience, security, U.S.